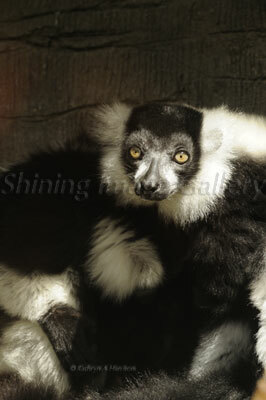 The black and white ruffed lemur (Varecia variegata variegata) is one of the largest lemurs alive today. From the top of the head to the tip of the tail they can grow up to four feet long, but they only weigh eight or ten pounds. Both males and females look the same, with black and white markings and a ruff or fringe of long white fur around their ears and neck. Black and white ruffed lemurs live in small groups. There are usually only two to five lemurs in each group. They all share a common home territory that they defend from neighboring groups. One way they do this is by using loud calls to let other lemurs know that they are there. They also work together to protect each other from predators. Boa constrictors, eagles and a predator called a fossa all like to eat the lemurs. If a lemur spots a predator, it makes a loud alarm call to alert the other members of its group. Members of a group also groom each other with their teeth. This helps to keep each lemur clean and to keep friendships strong in the group. A black and white lemur mother will have two or three babies at once. Many other monkeys and lemurs only have one baby at a time. Black and white lemur mothers also hide their babies in a safe place. Many other monkeys and lemurs keep their babies with them all the time. When a baby is three weeks old, it starts to follow its mother around, and it can keep up with her when it is only seven weeks old! Black and white ruffed lemurs live in the eastern rainforests of Madagascar. They eat fruit and other plants. Black and white ruffed lemurs are endangered because people are cutting down their forest homes in order to grow food. People also like to eat the lemurs a fact quite shocking to Europeans . Jonah Ratsimbazafy and other conservationists are working to help stop the habitat destruction and hunting to save the black and white ruffed lemur and its habitat.